The UN Secretary-General, Antonio Guterres is greeted by officals as he arrives in Canada for the G7 meeting. 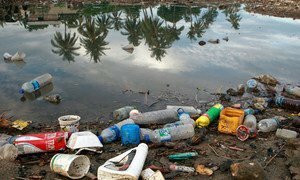 Unless there is a change of course, the amount of plastic waste in the world’s oceans will outweigh the fish that live in them, by 2050, said the United Nations Secretary-General on Saturday, declaring that the world now faces a “global emergency” over the oceans. “The facts are clear. Our oceans are a mess,” said António Guterres at an outreach event, that was part of the Group of Seven - or G7 - Summit of industrialized nations, taking place over two days, in Charlevoix, Canada. The G7 group of advanced economies, consists of Canada, France, Germany, Italy, Japan, the United Kingdom and the United States. “Plastic waste is now found in the most remote areas of the planet. It kills marine life and is doing major harm to communities that depend on fishing and tourism,” he added. Pointing out that one mass of plastic in the Pacific is now bigger than France, Mr. Guterres welcomed the G7 Plastics Charter, agreed on Saturday, which is being seen by some observers as a Paris-style watershed moment for cleaning up ocean garbage, referencing the 2015 Agreement on climate change. “Make no mistake, we are in a battle. And we are losing on every front,” he stressed. The UN chief painted a picture of fish stocks being crippled by overfishing, vast coastal dead zones from pollution and untreated waste being discharged into the sea. “And, to compound these issues, we have the growing impacts of climate change,” he asserted. Ocean acidification is disrupting the marine food chain and record-level ocean temperatures are killing coral reefs and creating fiercer, more frequent storms. Moreover, 40 per cent of the world’s population lives within 100 kilometres of a coast – leaving them vulnerable to storms, sea level rise and coastal erosion. Low-lying island nations and many coastal cities are in jeopardy of inundation, the Secretary-General spelled out. “Our guide is the Sustainable Development Goals [SDGs], and especially Goal 14 with its 10 targets from addressing marine pollution and acidification, to ending overfishing and protecting ecosystems,” he elaborated. “Our legal framework is the United Nations Convention on the Law of the Sea – the world’s ‘constitution for the oceans,’” he added. “And that is why I am here today. To sound the alarm. To inject a sense of real urgency in your deliberations and decision-making,” he said. “Your leadership is needed now, more than ever – on combatting land-based pollution; on creating marine protected areas; on reviving fisheries; on building the resilience of coastal ecosystems and communities, and, especially, on climate change,” he added. He flagged that if our seas and oceans are not protected, and we lose the battle against climate change, all the assumptions on which our policy-making has been based “will be worthless”. “Take seriously these threats to our global environment and understand that our collective future and security is at stake,” he concluded.